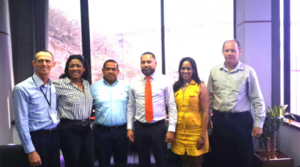 WILLEMSTAD - Mr. Fabio Velazquez, the Mayor of the city Riohacha (Colombia) recently paid a visit to Curaçao Ports Authority (CPA). The Mayor was accompanied by a delegation of Colombian authorities. Mr. Koopmans (Technical Manager CPA), Mr. Manotas (CCO CPA) and Mr. Zwueste (COO CPA) received the Colombian delegation. During their meeting they had a fruitful discussion on interesting topics such as Inter-regional trade, maritime connectivity and port development opportunities related to the cruise business.